With Scotiabank increasing their posted fix rates today, following their counterparts at BMO, CIBC, RBC, and TD Bank, the new mortgage qualifying rate also known as the mortgage stress test benchmark, is set to move higher by tomorrow, assuming the Bank of Canada follows through. The new qualifying rate for all mortgage borrowers should move from 5.14% to 5.34%. In other words, borrowers will have to qualify for a mortgage at a minimum of 5.34% regardless of your actual mortgage rate. This is expected to chip away an additional 1.5% of borrowing power, in addition to the 20% reduction of purchasing power the stress test has already evaporated. The continued tightening of mortgage credit comes at a rather intriguing time. Just last week Bank of Canada Governor Stephen Poloz warned about higher rates jumping too quickly on over indebted households. 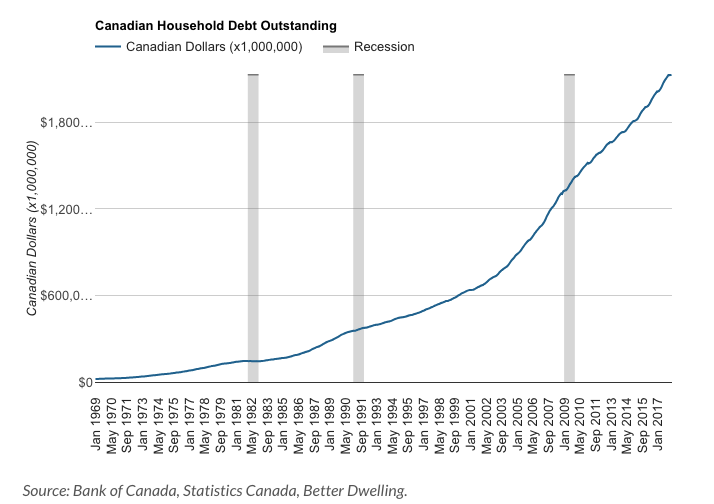 Canadian households owed just over $2 trillion in debt, with mortgages making up nearly three-quarters of this debt. Recent interest rate increases will hit particularly vulnerable households the hardest. Some 8% of indebted households owe 350% or more of their gross income, representing a bit more than 20 per cent of total household debt. However, with the United States continuing to move rates higher there is little the Bank of Canada and Stephen Poloz can do to put a lid on things. It’s not all bad news though, if you’re looking to catch a break on a mortgage BMO has come out swinging with its latest spring promo. The country’s fourth largest bank is advertising a red-hot prime – 1.00% variable. At 2.45% currently, it’s now the best variable rate for refis in the country. Better move quick, its set to expire at the end of May.